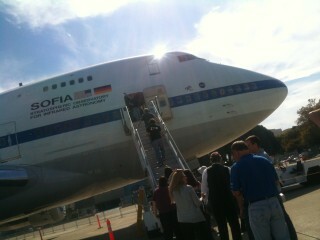 the draw of the day was to see SOFIA a 747 converted to fly a 2.7M telescope fitted in the back of the aircraft. 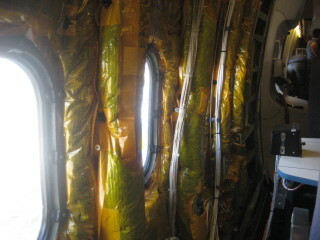 flying at an altitude above 40K feet allows seeing most of the infrared light eaten by the thick atmosphere. think detachable telescope. the advantage of a flying telescope is that it is not limited to where events happen. 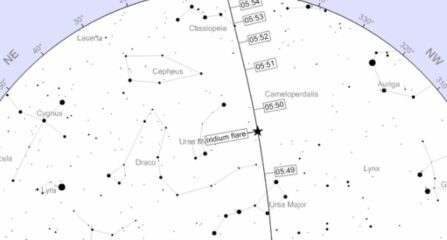 it can go to the southern hemisphere if something interesting happens such as a new super nova. 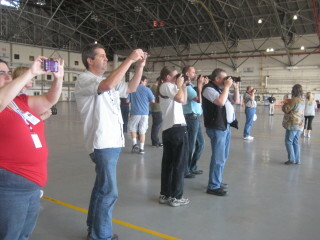 a NASA Social day is often filled with more than just the main event. 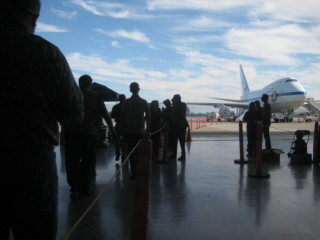 in touring NASA AMES that day we saw the Super Computer Center, the full motion flight simulator room, a talk on KEPLER, and TWO briefings on the specifics of SOFIA, and a tour of the 747 itself. there is a lot of information to catch. most of it thankfully can be found online after the fact. so there is almost never a reason for mad scribbling. 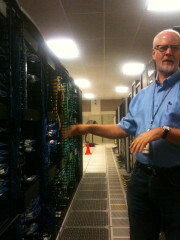 the Advanced Super Computer Facility at AMES is like every other super computer. 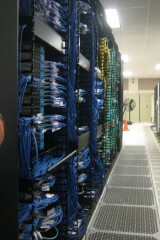 it was made of off the shelf parts much the same way a Google or Yahoo or Facebook data centers are created. although today the these parts are more specific to the task and not just a stock motherboard, power supply, hope we can keep it cool kind of a build. photos in the hallway show past the past with include hardware from Cray, IBM, and Silicon Graphics. I had toured the SCC once before during an AMES open house when some of these old timers were present. the round Cray with seating was being retired for a larger version of it that were rows of 19” racks. the new computer did not look cool like the old one. there was a graph during the presentation that showed the increase in gigaflops of various hardware over the years. sadly, there was no POWER required overlay. I wish I had thought to ask about it. 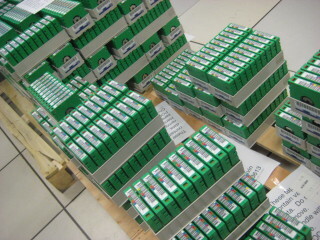 I did ask what the failure rate of the stack which was revealed to be 10% or less of it is in a FAIL’d state. as clean and organized the racks maintaining and swapping would be quick after identifying the borked board. 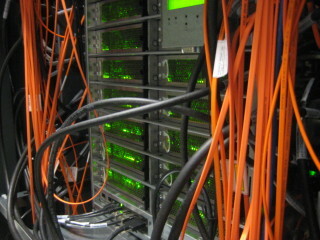 one interesting thing was the racks themselves were recycled from the previous installation. they were badged SGI but that was not what filled them. which is perfect, why give up perfectly working cabinets over a logo. 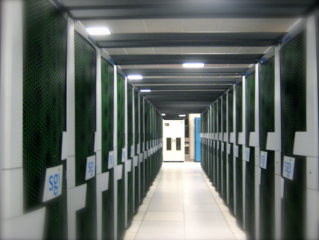 if you compare the data centers with the NASA super computer you some big differences even though they look nearly the same. heating, cooling and power have always been problems to solve. and while the datacenter sees these things as new problems they have been solved over and over again here as NASA has been using them LONG before anyone was using super computers to fling cat videos and status updates. the take away from super computer tour was the cost. for the money it took to fly a single Shuttle mission the super computer program can run for 25 years. with upgrades. 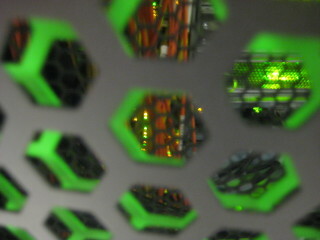 the thing that you cannot simulate with a super computer is human senses. aerodynamic forces of flight are easily rendered but how that feels to a person cannot. inertia is what makes falling feel that way. it also makes spinning trick your eyes into believing what it your body is feeling not what the instruments are telling you. testing pilots reaction to research in an actual aircraft has potential to lose both the pilot and the craft. meaning the better place to do that is in a simulator. 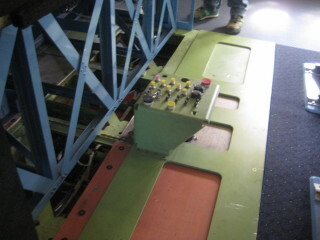 this is a photo set of the cable track for the floating cockpit. you can get a idea of the size of the space from it. 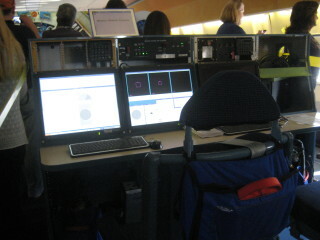 the FULL MOTION simulator also for most pilot experiences to be composed. and because it is a simulator the experience can be reset and retested over and over again using as many pilots as the study requires. the sim is not only cheaper than actual flying it is lots, lots safer. 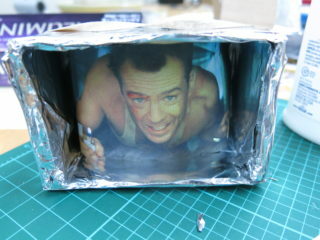 the room can be configured for almost anything that flies. 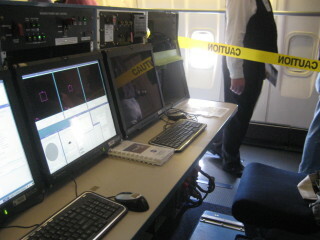 the inventory of cockpits includes complex commercial aircraft, military fighter jets, simple general aviation airplanes, the Space Shuttle, and a Lunar Lander. 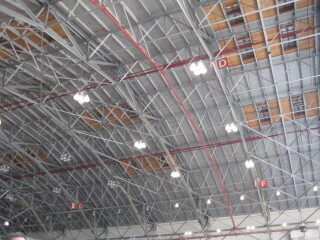 these are boxes that have the seats, windows, and controls expected. as far as the pilot is concerned it is flying. a lot of the controls for this room were old, having not been replaced since it was first built. but key upgrades in the aircraft boxes make the the experience more real. and motion itself does not change as technology gets better. 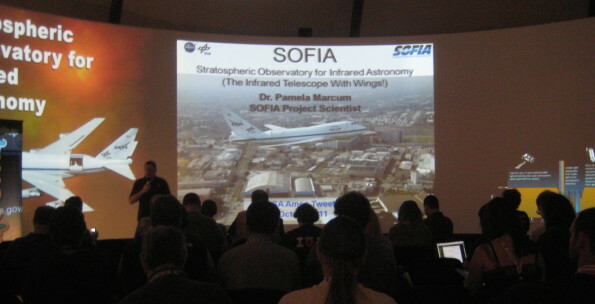 there were TWO presentations about SOFIA. 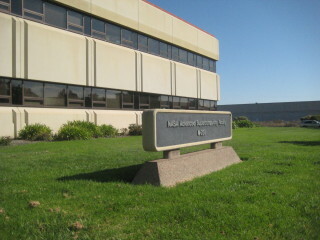 the first covered history, creation, specs, and operations. 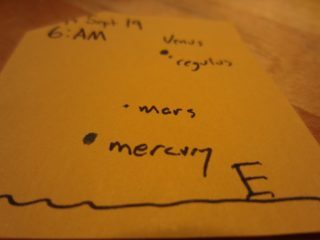 the second presentation covered science. 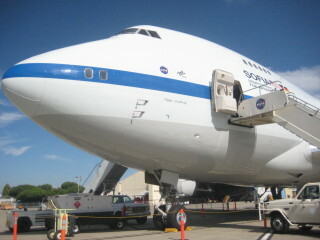 flying telescopes have been a NASA mission since the 1974. the first platform was a modified C141. when purchase in 1971 the airframe had 400 hours. 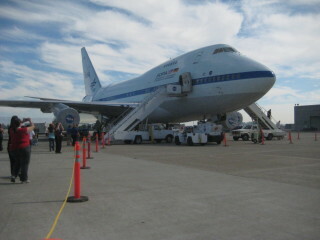 the Kuiper Airborne Observatory fly 13,000 before it was retired studying everything from inner most Mercury to confirming that outermost Pluto had an atmosphere. 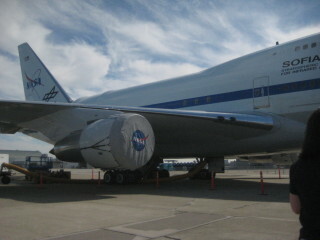 by comparison to SOFIA the telescope on KAO was tiny at just 36 inches. for comparison most home telescopes are 8-10 inches. 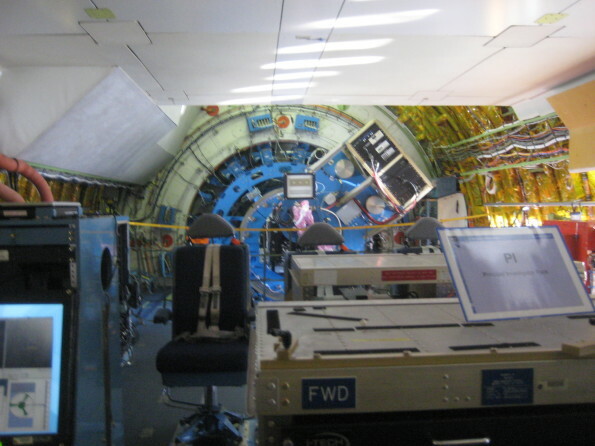 KAO was retired in 1995.
two years later work started on converting a 747-SP to become the platform for the 2.7 meter telescope. almost all of the interior of the former passenger jet was removed for weight. this extends the range of aircraft. when I saw it most of the vintage First Class sitting was still in place. although I have read those seats have been removed after a retro fit. replacing seats are workstations for scientists. 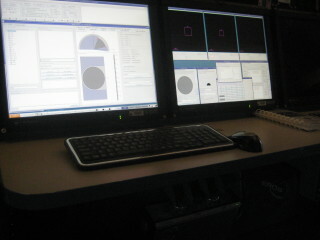 these control the telescope, gather data, and help process images for verification. 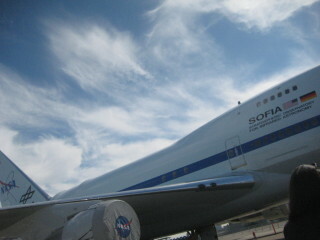 SOFIA can image any object in the sky. depending on where the object is and the length of imaging time determines the path of flight. [telescope talks to the auto pilot confirm]. 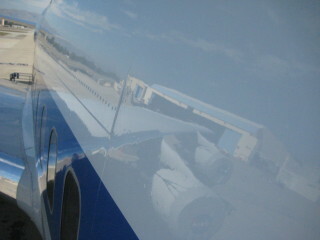 flying at 40K feet puts the telescope above 99% of water vapor that blocks or disrupts infrared light. 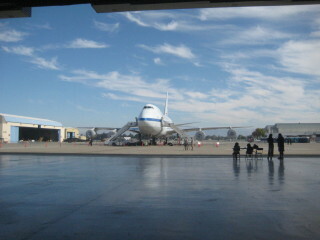 flying also allow the telescope to get to events that happen at specific times and places on earth. as it is not possible to move ground based telescopes you either get lucky or the event goes unseen. 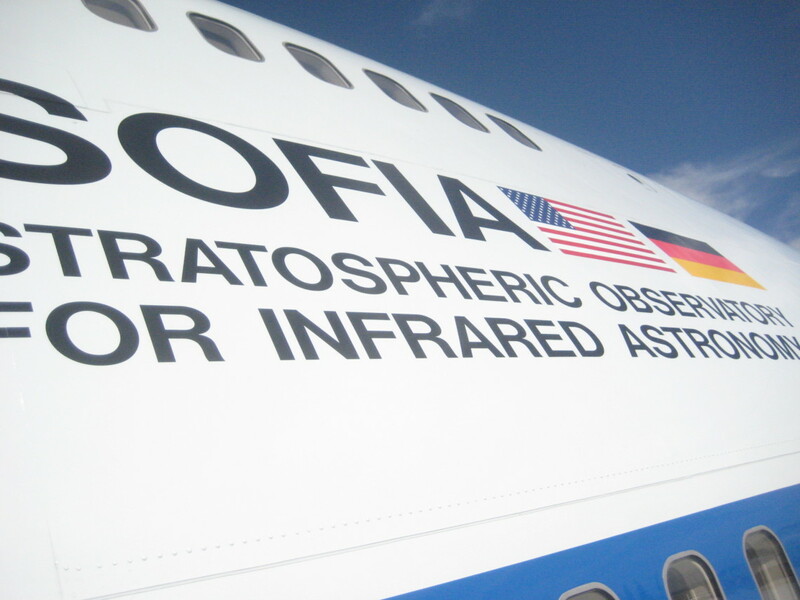 although SOFIA can be used for visual observations other instruments offer better scientific data. 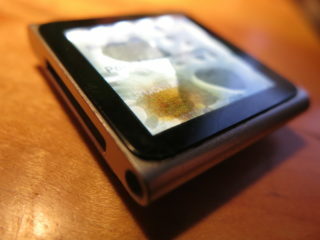 9 different packages can be attached the mirror relatively quickly. a space based telescope would not be reconfigurable the same way. 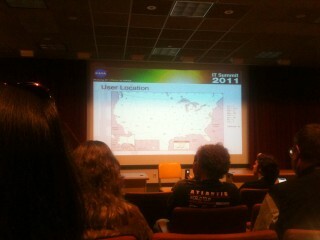 this gives the project maximum flexibility for observations. you can follow SOFIA flights several ways. 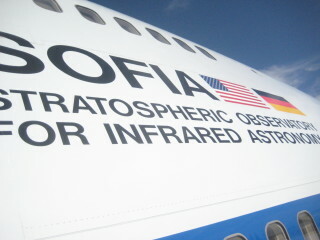 follow @SOFIAtelescope on twitter. flighttracker.com provides near realtime location when SOFIA is flying but the tail number N747NA.